A blog that details websites, mobile apps and others ways to earn money online. This includes making money online from survey websites, ptc websites and gpt (get paid too) websites as well as mobile phone applications. Other websites will be featured too. This blog will try and walk through how to make money online, what countries are accepted and payout methods. This well feature online jobs and work from home opportunities too. You probably won't get rich but extra money will be good. Streetbees review – 87 countries – Popular in US, India, Brazil, Italy and the UK. 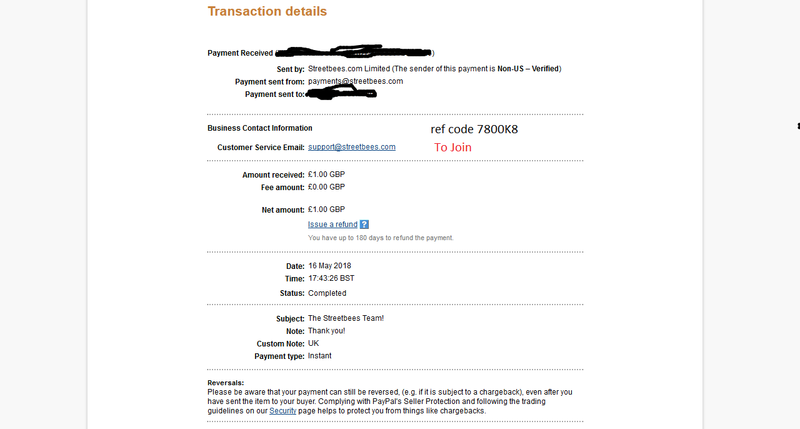 This is a free PayPal cash app, there is Streetbees proof from PayPal posted below. How does Streetbees work? It’s a mobile phone application that creates surveys and tasks for you to complete, this includes answering questions and taking photographs. Streetbees states it has 500,000 tasks around the world, some of their tasks don’t pay but they qualify you for paying tasks, so it’s a good idea to interact with them. Is streetbees legit? 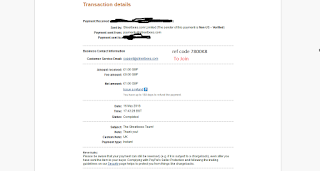 Streetbees paid out quite quickly to my Paypal account, I had the money within 24 hours of completing the task. I have seen tasks that pay up to £5 pounds. Although the record for earnings in one day is $1800 dollars, but that was to a streetbees ambassador. Streetbees are serious about their AI business and recently raised 12 million dollars in venture capital to invest. So they are serious about their intent, they also have business links with major companies. I have this app installed on my phone and I check it regularly, it’s a great way to top up your income from a job, although their paid tasks have been quite few and far between. This may be down to my demographic and location, another person might have more luck. Streetbees referral code: 7800K8 please use this if you sign up, as this helps raise the money for my free time to investigate these sites. What is 2captcha? It is a website that pays to solve captchas. Captchas are little puzzles to check if a user is human and not a bot. It doesn’t pay a great rate of 38 cents for every 1000 captchas solved, if you install the browser software you can get paid 1 dollar for every 1000 recaptchas solved. It pays out to webmoney, adv cash, perfect money, uphold.com, coinbase.com and bitcoin with various minimum payouts. 2captcha claims you can earn 50 cents for 1-2 hours work, payout takes 3-5 working days to process. Before you can start to work, you have to take a tutorial on how to complete captchas. Does 2captcha really pay? Yes, I have seen plenty of evidence of proof. Does 2captcha work? Yes, there have been plenty of payouts. 2captcha might be worth it for lower income countries, especially if they can’t find a more profitable website to work on. Otherwise avoid. 1/5 rating. There is a risk google can ban your IP address from doing this. Although in most cases you can reset your router and you can get a new IP address.